The EuroLambretta Jamboree is a yearly event where Lambretta owners can meet fellow Lambretta riders. It takes place in the month June. Each year a national club from a country in Europe takes the honours to organise this beautiful event. 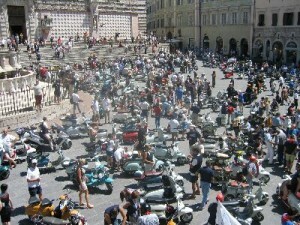 An average of 400+ Lambretta scooters is what you’ll see on such meeting. For 2015 is the organisation of EuroLambretta is appointed to the Lambretta Club Austria. A lot of Lambretta owners are planning their holiday long upfront to be able to travel to EuroLambretta and join there with their friends. The more adventures riders don’t mind travelling 1000+ kilometre on their scooters to join the event. Of course such trip takes a lot of preparation, it is not unusually that repairs are done at the side of the road in case of sudden brake down. The event is spread over the weekend and several organised rideouts take place. Also there is a gymkhana and concours d’elegance with different classes to compete. On saturday evening everybody dresses up, mostly in their national club outfit, to join the luxury supper. An overview of the past and yet to come EuroLambretta jamborees.